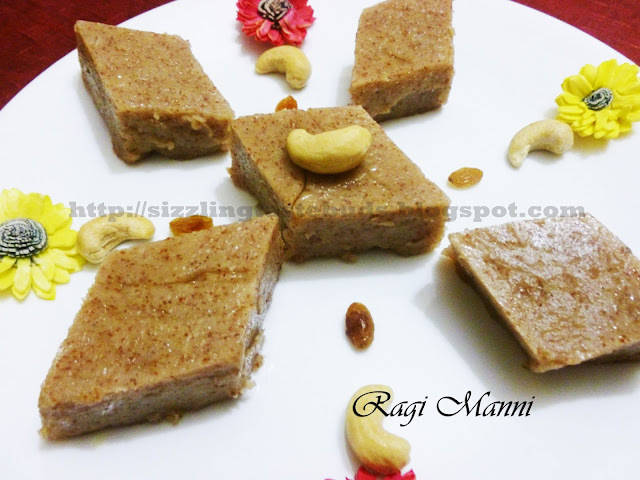 Ragi Manni is a tradional South Indian sweet dish prepared with Ragi (Finger Millets), Jaggery and coconut milk. Ragi Manni is most popular along the coastal belt. Because of the heat during summer, they have more of ragi in their diet to keep their body cool. Like in Karnataka, people prepare Ragi Mudde(Ragi Balls) for lunch and have it with piping hot Bassaru. Knowing the health benefits of this cute red pearls we give this high nutrient packed cereal for infants too. Now coming back to Ragi Manni. My granny used to make this more often. I learnt this dish from my granny and mom. My mom too had not tried on this before until she was gifted this by her friend who has this grown in her fields. My mom passed it on to me. 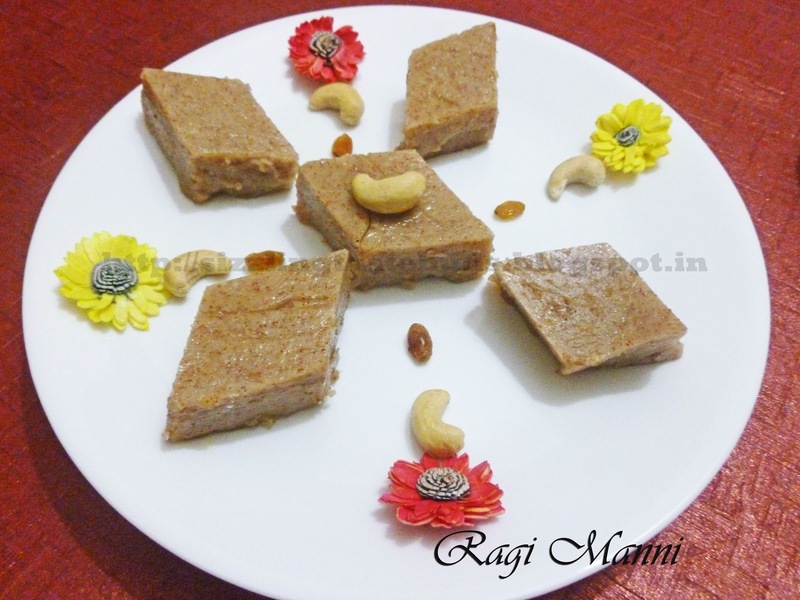 So we both planned to prepare this traditional sweet dish together and when she came to my place, we tried our hands on this and it came out well. I loved watching and helping her. Well the stirring part which is the main part of this dish was prepared by my mom. Everyone liked it. Planning to prepare this again this weekend. 1. Soak Ragi grains for atleast 2 hours. 2. Add water and make a fine paste in a blender. 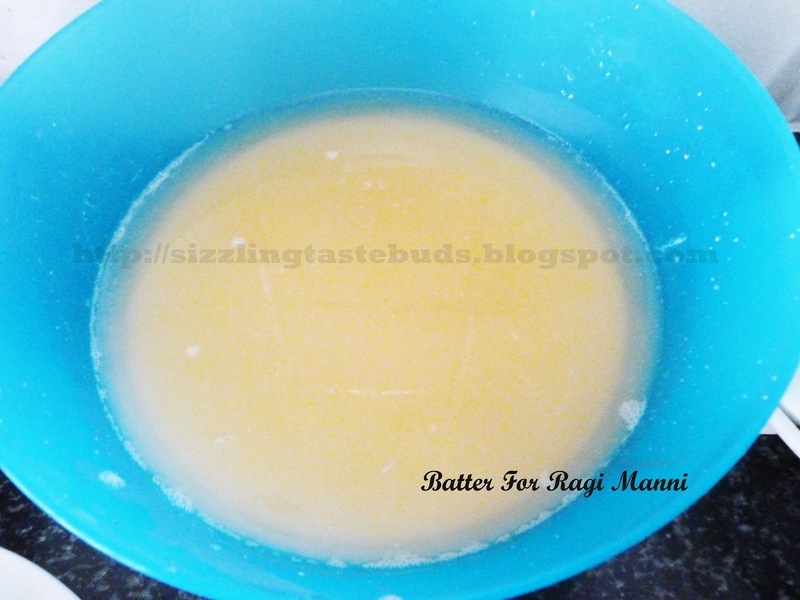 Strain it to remove ragi peels or husks. 3. Transfer this to a bowl and leave it untouched for 2-3 hours till ragi gets settled down. After 2-3 hours, remove the water layer formed. 4. 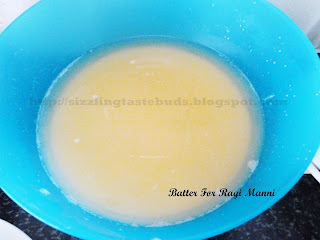 Extract coconut milk from freshly grated coconut and add this to the ragi mixture. Add add in the jaggery , a pich of salt and cardamom powder. Mix well and cook it in a low to medium flame. 5. Keep stirring so that the mixture doesnot stick to the bottom. Cook till the mixture hardens and you get a halwa constistency. 6. Shift it to a greased plate and spread evenly. Allow it to cool for some time and then cut it into desired shape. 7. 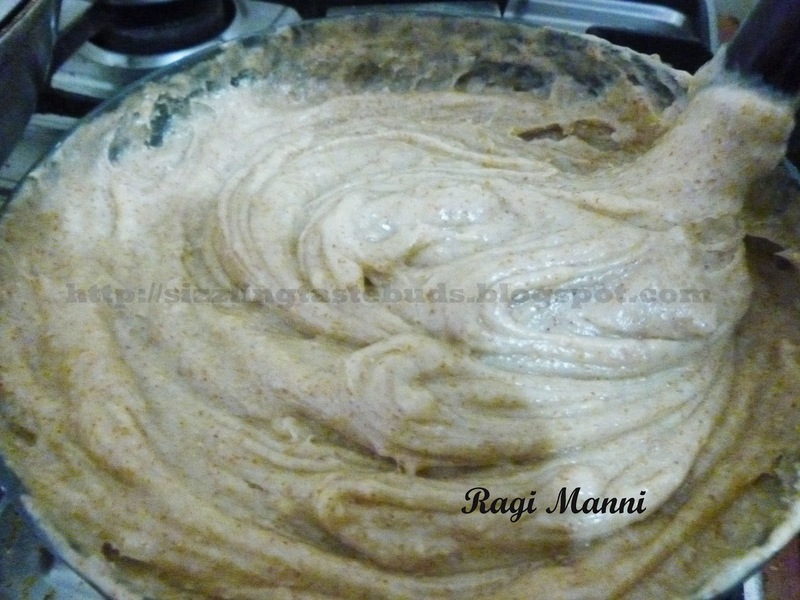 Ragi Manni is ready to be served. It tastes best when chilled.